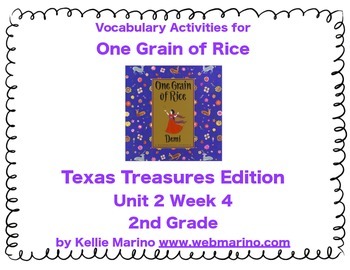 This vocabulary activity and instruction pack is made to correlate with Texas Treasures Unit 2 Week 4 - One Grain of Rice. It can be used for direct instruction of vocabulary and then as support materials at a vocabulary station or guided reading. There are 5 components to this vocabulary pack. All of the pieces are color coded except for the definitions. 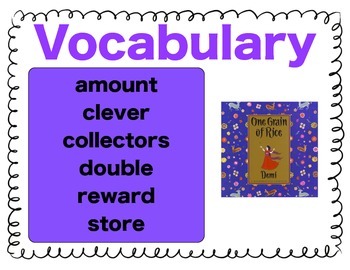 1) Vocabulary- Words are written out on individual cards for reading and posting. 2) Syllables- Words are broken into syllable cards so students can see and read the component parts and then put them together in the right order. 3) Define- Definitions are written out to be matched with the correct word. 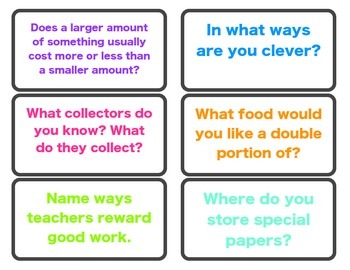 4) Ask- One oral vocabulary discussion card is provided for each word. These could be put on a ring and used during down times to discuss vocabulary. 5) Example- There is one color picture card to match each word as well as a sentence that matches the card. The sentence is written out to be cut into pieces and put back in order. 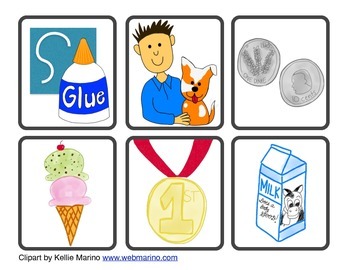 This pack makes teaching weekly vocabulary easy and fun with its colorful cards. Students are engaged with the matching activities and reading! Texas Treasures Vocabulary Activities by Kellie Marino is licensed under a Creative Commons Attribution-ShareAlike 3.0 Unported License.